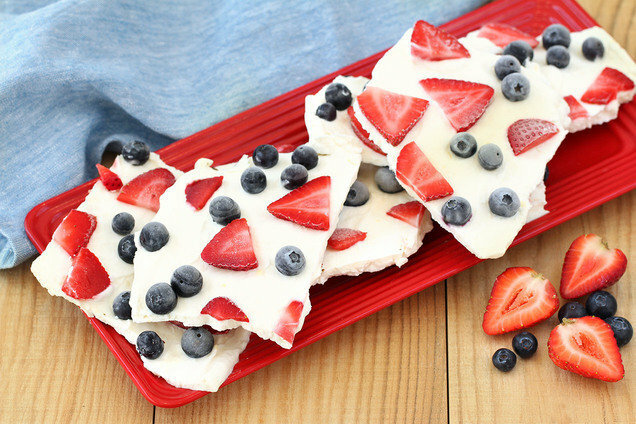 Here’s a fun twist on frozen treats that’s perfect for the Fourth of July: fruity frozen yogurt bark! Delicious, patriotic, beauteous, low in calories... What more could you ask for? In a medium-large bowl, combine all ingredients except berries. Mix until smooth and uniform. Spread mixture onto the baking sheet in a thin layer, about 1/4 inch thick. Top with berries, and lightly press to adhere. Lightly cover with foil and freeze until firm, at least 2 hours. Slice or break into 6 pieces. Hungry for More Healthy Recipes for the Fourth of July? HG Heads-Up: There will be no Hungry Girl email tomorrow, July 4th. But we'll be back on Thursday with a brand-new no-cook recipe you'll make all summer long (and beyond)!